This amazing documentary, now available for the first time on DVD, highlights the films of the great horror director, George A. Romero. An intimate look at Romero’s creative process, this film contains an outstanding collection of interviews and behind-the-scenes footage on the set of DAWN OF THE DEAD. Also included are amazing demonstrations at how some of the over-the-top special effects were created by Make-Up Effects Artist, Tom Savini. 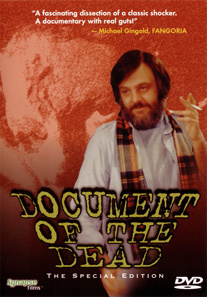 DOCUMENT OF THE DEAD is a Gold Award winner of the Houston International Film Festival and contains scenes from the film classics NIGHT OF THE LIVING DEAD, MARTIN and MONKEY SHINES. This film is must for all hard-core horror fans! – Audio Commentary track by Roy Frumkes and others, commenting on the making of this fascinating documentary.